Welcome to The Old Castle Shop, our stone masonry, timber framing, iron working, and woodworking shop. This is the stone and wood working shop for Burg Jägerhof , our medieval castle. From this shop we worked on the various tasks that were required to build our castle and now to maintain our castle. And we are also timber framers, woodworkers, and blacksmiths. So we work with and build with various cuts of timber, timbers, logs, types of wood, iron, and we hand carve wood. Most of our tools are hand tools, by choice. But a few machine and power tools make the job faster and are used in our shop and also on the job sites. At a later time we may have our school open again. This school has masonry, timber working, woodcarving, and blacksmithing classes. The books on masonry, stone mason tools, and equipment on this page are offered for sale in association with Amazon.com. ORDERING PRODUCTS: For individual book, tools, and equipment descriptions, content, prices, and availability, click on the book, tools, and equipment title. Read the details, then to purchase, place your book, tools, or equipment in the shopping cart at the Amazon.com page. Complete your purchase by following their instructions at the shopping cart. If you are not ready to complete your purchase at that time, your book, tools, and equipment can remain in the shopping cart until you are ready to purchase your tools, books, and equipment, your choice can be "stored" for up to eighty nine days. Then when you are ready to complete your purchase, return to the shopping cart at Amazon.com and complete your purchase by following their instructions at the shopping cart. Ordering your masonry books, tools, and equipment with Amazon.com through our Lübeck Haus Store and Bookstore is convenient, quick, safe and easy. These browser boxes will allow you to search the entire Amazon.com website for masonry tools, masonry books, construction equipment, and other products. New interesting articles dealing with stone masonry, medieval castle builders, timberframing links, and other information pertaining to stone and timber construction are being added all the time. For a discussion on designing and constructing a stone and timber castle. Click Here . Then, use your browser's Back Button to return here. This link will connect to Lübeck Haus Bookstores list of stone masonry books, including lime mortar books. This link will connect to Lübeck Haus Bookstores extensive list of stone masonry books. This link will connect to Lübeck Haus Store's list of Trow and Holden stone masonry tools. This link will connect to Lübeck Haus Bookstores select list of books for and about stone buildings and structural engineering. This link will connect to Lübeck Haus Bookstores select list of books for and about stone sculptures and sculpturing. This link will connect to Lübeck Haus Bookstores select list of books for building kilms. This link will connect to Lübeck Haus Bookstores extensive list of building construction books. National Concrete Masonry Association Homepage . An online resource for concrete and masonry information. Masonry Institute of Washington HomePage . Technical resources: bulletins, glossary, links, information, and handbooks: including the Northwest Masonry Guide. Glossary of Masonry and Stone Working Terminology from Huckleberry Stone Supply . This is an extensive glossary of masonry and stone working terminology. Timber framers organization Timber Framers Guild . A non-profit educational membership association dedicated to the craft of timber framing. This guild serves as a center of timber frame information and designs for the professional and the general public. Members of this shop are members of this fine organization. Custom designs and constructs unique timber framed homes and buildings. Home based in the Pacific Northwest. The premier manufacturer and distributor of brick and concrete products in the Pacific Northwest. Includes concrete block, residential brick, and manufactured stones. The place in the Pacific Northwest where masonry contractors, builders and landscapers can find just about any size, type, and quantity of quality stones for large and small projects. An excellent source for information on using cedar wood for roofing material. Has a useful online manual. North America's Largest Quarrier of Basalt. Huckleberry Stone Supply has been serving satisfied customers for over 25 years. The Dry Stone Conservancy works to preserve existing dry-laid stone structures, and to revive and promote the ancient craft of dry stone masonry. The Stone Foundation is a society of stonemasons and others involved with and/or interested in stone, stonework and stone art. Publisher of STONEXUS Magazine, the highly regarded periodical publication of the Stone Foundation is available only to the member/subscribers. A Webring devoted to Stone Circles, Megaliths and other Prehistoric Sites around the world. Sites featured include hundreds of images, travel guides, archaeology, and archaeoastronomy. This four-day school of learning and sharing covers building with stone, using mortar and dry stack methods, sculptural and architectural carving, traditional lettering, mortar, and tools. One project this year is to build a dry stack stone bridge, no mortar or rebar will be used. To view photographs of the planning, building, and completion of the dry stack stone bridge, Click Here. The 5th Annual StoneFest will address both traditional and contemporary methods of working with stone in architectural, landscape and sculptural contexts. These educational classes offer a unique opportunity for the stonemason, the stone carver, architect, landscape designer, or simply anyone who simply wants to further their knowledge of working with stone. Learn with professionals from the natural stone industry with hands-on learning projects, presentations, demonstrations, audio/visual talks and discussion forums. These books are useful for understanding traditional stone masonry methods taught in some of these classes for 2009. 6th Annual Stone Masonry School; Septemer 13-17, 2010. The 6th Annual StoneFest features a challenging project. This is the building of a large stone beehive structure, called a Clochan. The Clochan will be designed and built in the traditional Irish style, while incorporating contemporary design techniques. Click on for complete details of this project and for all of the other masonry and stone carving classes. Select your stone, brick, and block masonry tools from these tool suppliers. Trow and Holden Company, Bon, Coopertools, AMPCO, Vaughan And Bushnell, Stanley Consumer Tools, Olympia Industrial, Estwing, Barco Industries, Rocket, and Marshalltown Trowel Company. Select additional masonry tools, including Stainless Steel Masonry Trowels, Chisels, Hammers, 48" Masonry Levels, Paver Extracting Tongs, powered masonry saws, Masonry Grinding Wheels, Masonry Drill Bit Sets, Masonry Drill Bit, Carbide-Tipped Spiral Drill Bits, Brushes, Masons Gloves, and much more. A large section of masonry hammers and equipment. Including Chipping hammers, Rock picks, Rock hammers, Soft stone hammers, Professional brick hammers, Stone splitting wedges, Hand hammers, Round hammers, and Tile stting hammers. A great selection of masonry hammers and hammer sets made by Trow and Holden Company. A selection of masonry hammers and chisels made by Trow and Holden Company. Masonry saws from Makita, Pro-grade, Hitachi, Dewalt, Diamond Turbo, MK Diamond, and others. Masonry saw blades from Target, Longer Diamond Tools, Granite City Tool, Diamond Products, MK Diamond, Norton, DeWalt, Vermont American, Ali Industries, ICS, Bullard Abrasives, Bosch, and more. Select from more that seventy rebar cutters, including those that will cut any size rebar up to #6. Models include Electric Rebar Cutters, portable Electric and Cordless Rebar Cutters, Hydraulic Rebar Cutter, and several models that are both a Rebar Cutter & Bender. The Old Castle Shop Book Centers excellent selection of timber building construction and engineering books. Subscription selections include Architectural Review, Fine Homebuilding, Journal of Light Construction, Building Design & Construction, Timber Framing, Brick Bulletin, and Masonry Construction. Lübeck Haus Bookstores excellent selection of masonry books covering stone, concrete, block, and brick. Lübeck Haus Bookstores excellent selection of masonry kindle books covering stone masonry. Lübeck Haus Bookstores excellent selection of masonry books covering the making and using lime mortars. We have for sale several blacksmithing and working with wrought iron books for your consideration. Browse for the building construction books that you need and for additional professional & technical books. Browse for the building engineering books that you need and for additional engineering & technical books. Visit the Timber Framing Store . Offers a selection of timber framing tools, timber framing books and eBooks, power generators, logging tools, and construction equipment. Explore and browse a great selection of equipment and tools for almost any construction contractor's job. Explore and browse a huge selection of hand tools for almost any construction contractor's job or any other job. Portable AC Power Generators made by Brigs & Stratton, Power Max, Buffalo Tools, Coleman, Porter Cable, Yamaha, and others. Includes hard hats and liners from leading maufacturers. Plus a selection of "Hard Hat Required" signs. Power tools, router tables, drills, hammers, tool belts, carpenters apron, nail pouches, carpenters square, much more. These AC power generators packages include 115 VAC & 440 VAC power generators manufactured by Amico, Buffalo Tools, Briggs & Stratton, Coleman, Dewalt, Porter-Cable, Powermate, and PowerMax. Building Supplies & Heavy Equipment, Building Materials, Construction Machinery, Hydraulics, Ladders & Scaffolding, and Agricultural Equipment. Mens work boots from leading footware manufacturers including Carhartt, DeWalt, La Crosse, Red Wing, Wolverine, and Western Chief. Mens hard hats from leading work hard hat manufacturers. Select winter underware from leading clothing manufacturers. Offers Filson hunting jackets and Woolrich hunting shirts. These Filson Mackinaw Cruiser Jackets originated in the Straits of Mackinac, Michigan early 1800s. This selection of men and women boots includes Cabelas Alaska Hiking Boots, Mens Cabela's Northern Explorer Pac Boots, MEINDL Respond Mid GTX Mens Boots, MEINDL Burma Pro MFS Men's Boots, and Meindl Tampa Junior Mid XCR Shoes. Browse through hundreds of choices for woodcarving books. Browse through hundreds of choices for woodcarving books, and several woodcarving DVDs. The research, development and manufacturing division of Lee Valley Tools, Veritas® Tools, continues to be one of the most innovative hand-tool design firms in the world, producing unique and high-quality products. King Iron Works offers a wide range of hand-designer iron, custom yet modern wrought iron: iron gates, iron doors, iron railings, iron fenses, iron supplies, and custom items built to your design. Hand forged ornamental and construction iron for iron fences, iron gates, metal railing or iron staircase project. Includes Koenig Eisen section: Hand forged decorative wrought iron. Carries plain and decorative hardware and tools needed to finish your job. The Guédelon castle project offers a unique opportunity to study and to witness the different stages of a medieval castle's construction, each phase being of interest in its own right. In the heart of Puisaye, in Yonne, Burgundy, France, a team of fifty people have taken on an extraordinary feat: that is to build a castle using the very same construction techniques and materials used in the Middle Ages. An excellent example of a German castle. This castle is at the confluence of the Moselle and Eltz Rivers above the town of Mosel Kern, near Koblenz, Rhineland-Pfalz. This is a large castle over looking the Rhine River valley near Bacharach, Rhineland-Pfalz. Burg Heidenreichstein is a fine castle in Niederösterreich, Austria. A clasp view of the southern wall. Greifenstein an der Donau. 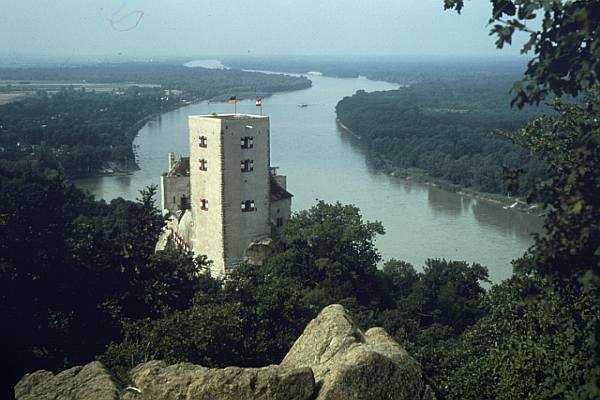 Burg Greifenstein on the Danube River. 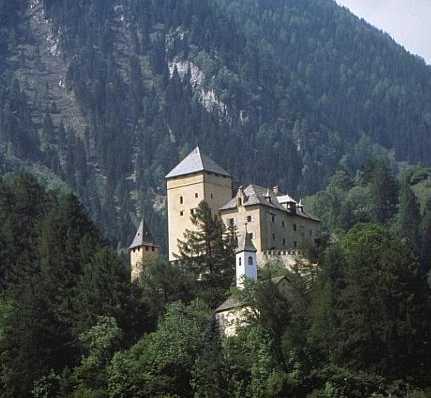 A grand view of Fortress Groppenstein in the Mölltal valley above the village of Obervellach, Kärnten, Austria. Die Burg Mauterndorf liegt im Lungau, im südlichsten Gau des Bundeslandes Salzburg. Die Marksburg bei Braubach am Rhein. A good view of this fine castle and the headquarters for the organization of German castles. Burg Seebenstein im Wechselgebiet. Close-up of wall details. 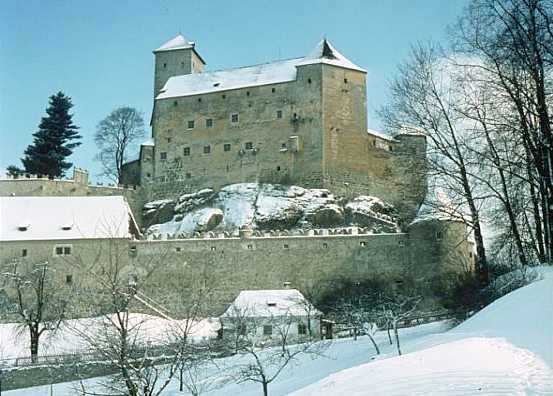 Blick auf Burg Rappottenstein im Waldviertel im Winter. 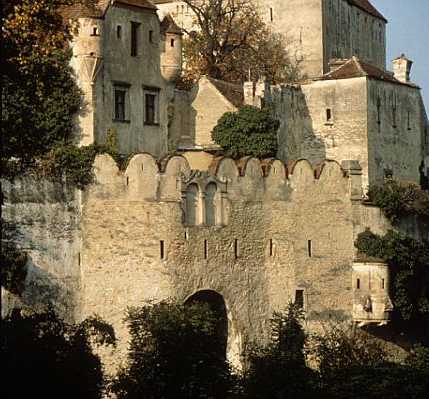 Built in 1077, this fortress stands guard above Salzburg, Austria. In addition read about some of the interesting history of Salzburg. A panoramic view of Festung Hohensalzburg. An interesting castle site. All text is in German. Festung bei Launsdorf, Kärnten(Carinthia), Austria. We are planning to build and are laying the ground work for a mid size castle to be built in the State of Washington. 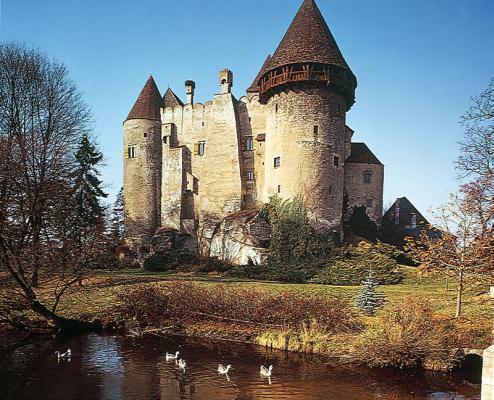 This full size stone and timber castle will be built along the style of a medieval period castle that could be found today in the Alps Mountain region of Europe. This castle will be of the Burg configeration rather than a Schloss. We will not copy any particular existing castle, but will design this castle from the ground up. For details of this project, please visit Medieval Castle Builders . Browse though this expanded list of our construction contractors equipment and tools to find what you need. Construction Contractors and Home Owners Supply has construction equipment, hardware, power and hand tools, plus exceptional tool values. Lübeck Haus Bookstores excellent selection of stone, masonry, and timber construction books. Lübeck Haus Bookstores excellent selection of building construction and engineering books. Visit this store for books, music CDs, movies, kindle readers, kindle books, home and office electronics, computers, cellular phones, professional software, computer & game software, hardware, power & hand tools, clothing, magazines, toys and games. Visit the Boulder Creek Trading Post and the Engineering and Technical Section of the Boulder Creek Bookstore. Offers a large selection of more than 500,000 fine art prints, wall posters, wall tapestries, photographs, and sculptures. Including many wall posters and art prints dealing with architecture, construction, bridges, famous building, castles, cathedrals, log cabins, and other structures. 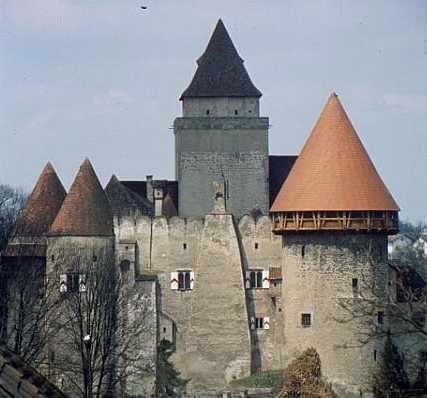 This site is a source of information, ideas, and additional help for those brave and daring builders who are planning to build, are building, or perhaps do own and maintain a medieval castle. Lübeck Haus has a good selection of videos about medieval castle, knights, mansions, and palaces. Use this list of website links to help you browse the web for what you are looking for. This Swiss site gives you your correct local time. Click on and browse through a selection of thousands of audio books. The Pacific Mountain Masonry Website Directory. Your online source for power and hand tools, stone masonry tools, construction contractor's equipment, stone masonry and timber framing books, log building construction books and tools, and how-to books for building contractors. Use these Browser Boxes to find more stone masonry tools, stone masonry books, construction equipment, find any book or any product from Amazon.com. This page was last reviewed May 24, 2018.